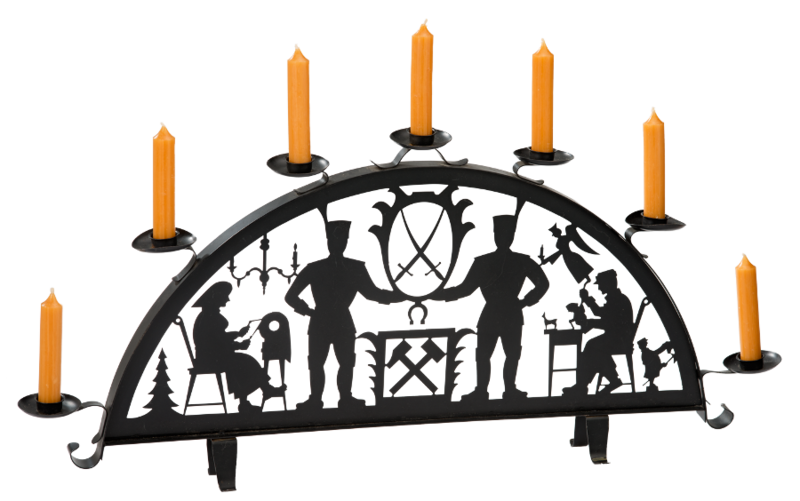 Like the candle holders or pyramids the Schwibbogen also became a symbol of Christmas merchandise from the Erzgebirge. The name comes from a famous architectural component known as a “Schwib” or “Schwebebogen” (suspended arch): an arch which appears to be freely suspended between two walls. As a light bearer it has its origins in the mining tradition. For example, it was usual in the Erzgebirge for the miners to meet for prayers together on 24 December and to celebrate Christmas together. In doing so they hung their burning pit lamps in a semi-circle on a wall or directly at the mouth to the tunnel to indicate the entrance to the tunnel. This resulted in the idea and shape of a freestanding arch of lights with candles on top. Under the arch shape there was room for decorative figurative representations. During the Christmas season they are traditionally placed on indoor window sills facing the street and bring warm inviting light into the dark night. The first Schwibbogen probably originated from the hands of the mine’s blacksmith Johann Teller, who is supposed to have forged it around 1726 in Johanngeorgenstadt. The oldest surviving Schwibbogen dates back to 1778 and was made by S.F. Teller. Schwibbogen fitted with a front section have only been known since the start of the 19th century. Schwibbogen were still made as one-offs until well into the 20th century and given to the mining guilds as a gift by the mine’s blacksmith. It is only after this that they began to be produced in numbers and sold in crafts shops, making Schwibbogen popular and introducing them into living rooms. The representations in the arch are defined by religious themes in early Schwibbogen and often show the sun, moon and stars, alongside Adam and Eve. There is a change at the start of the 19th century towards predominantly mining motifs. There were other changes in terms of the material, in that now it was mainly Schwibbogen stamped out of black sheet metal and made of wood which cam on the market instead of forged ones. The scenic representations also expanded from mining work to the entire life and crafts in the Erzgebirge. The Schwibbogen has the “Feieromd Exhibition” in 1937 in Schwarzenberg to thank for its fame today, as it was looking for something typical from the western Erzgebirge as an advertising symbol and chose a Schwibbogen. As part of this, the 7 x 4 metre “Schwarzenberger Schwibbogen” was produced out of metal by the master forgers Curt Teller and Max Adler based on a design by Paula Jordan as the first large-scale Schwibbogen. It is equipped with gas lights and symbolically shows the history of the Erzgebirge in the arch. The “Seiffener Schwibbogen” made of wood that was built around 1935 at the toy college in Seiffen based on a design by Max Schanz, with the motif of Seiffen’s church surrounded by snow-covered houses, is still the inspiration behind countless light arches today in terms of motif, just like the “Schwarzenberger Schwibbogen”. The large Schwibbogen usually set up on market squares since 1960 are part of the Christmas scenery in many towns and villages in the Erzgebirge.